Todai is in it's 4th year! 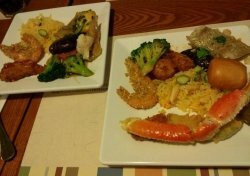 If you are a fan of international cuisine, especially in buffet style, I doubt Todai will sound new to you. I have been to Todai before for lunch, and they serve a variety of food, such as Korean, Chinese, Japanese cuisines and such. Most importantly, if you a die-hard fan of seafood, Todai does not fail you either. This year, Todai is celebrating its 4th year birthday anniversary, and I am glad to be trying out some of the birthday treats gathered from several parts of the globe. We were first served with two cold-platters, and mind you, one piece of each seafood is never enough. 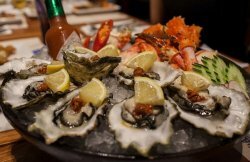 If you love oysters, Todai is supplying unlimited amount on every weekday dinner and all day weekend! 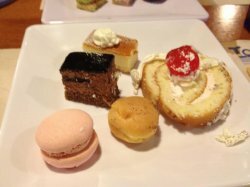 These are some of the birthday treats served in Todai, prepared specially for Todai's birthday anniversary. 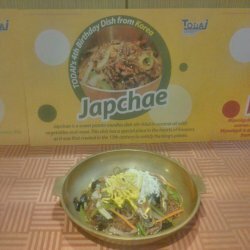 Japchae, is a Korean birthday dish, which is made up of sweet potato noodles stir-fried in sesame oil with vegetables and meat. The noodles taste like Chinese's cellophane noodles. Perhaps with the sesame oil, the noodle is smooth and sweet to slurp into your mouth. Another Korean birthday dish, Miyeokguk. It is actually a nutritious soup that consists of high iodine and calcium content. While this soup is traditionally meant for women whom have just given birth for recovery, it is now also a birthday dish, signifying the food and nutrition supplied by mothers during the pregnancy period. One of the popular birthday dish among the Chinese, Shoutao, which in mandarin is written as 寿桃. 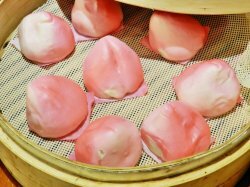 These buns are shaped like peaches, symbolizing long life and good health. 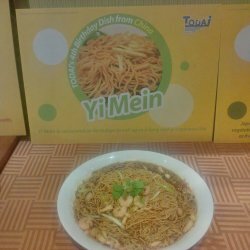 Yi Mein, also another Chinese dish. 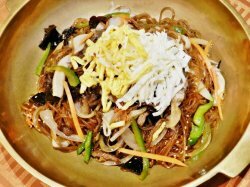 Similar to the Korean's Japchae, it is also known as the longevity noodle, calling upon a long and prosperous life. Ever remembering listening to hearsay that you need to slurp in the entire piece of noodle without breaking it? A birthday dish from Ghana, Africa, Oto. 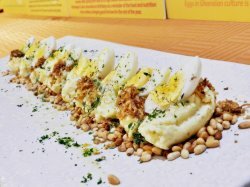 Made of hard-boiled eggs, mashed potato and palm oil. Oto is a dish that is supposed to be used mashed yam instead of mashed potato, but Todai's trial and errors found mashed potato suits Asian's taste more, thus the substitute. 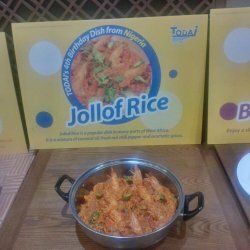 Jollof Rice from Nigeria. 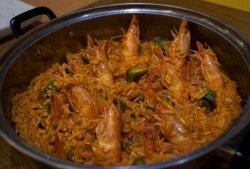 The mixture of coconut oil, fresh red chili pepper and aromatic spices, Jollof Rice authentically emit the flavour of African. I love the stickiness of the rice, just like the Chinese rice dumplings, and fresh prawns to go with the already-delicious rice. I am sure this cake has been known to most foodies, and of course a kid's eye-catching dish. 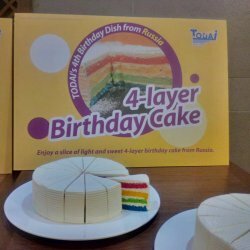 4-Layer Birthday Cake from Russia. A birthday is not a norm to go without a cake or sort. Vibrant layers of colour that got my fork slicing for more despite the cream. Todai is not just treating diners with their spread of birthday treats, but also celebrating it more with diners sharing the same birthday month! 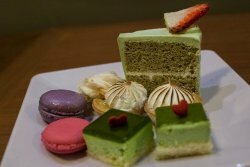 For the March babies, just get an isntant photo taken at Todai and you will receive a complimentary birthday cake (24 hours advance reservation)! Isn't that wonderful? If its not enough, Todai is also giving away a total of 5 passes which entitles you to enjoy unlimited buffet dining for 30 days consecutively! Of course, a minimum spend of $200 is required before you can take part in this incredible lucky draw. Fret not if you not one of the March babies or lucky winners. 10% off the bill if you are a UOB or Maybank Card Holder, and a free parking ticket with a minimum spending of $250 with UOB card. What piqued my interest was this Acorn Jelly,a gelatinous square that tasted like seaweed with the special korean chilli dressing. 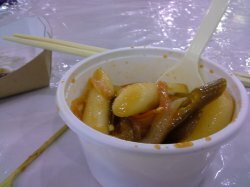 There is also a delicious variety of bancai (side dishes) to go along with the steamed rice. 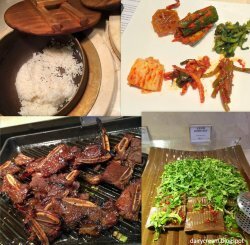 In case you are not sure where to start from, head to the Korean section if "quality" is the thing you pursue instead of "quantity". 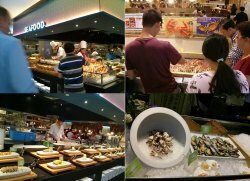 Since my 1st original visit to Todai in July 2013, I've returned several times to 'The Mother Of All Seafood Buffets' (SGD $68++ per person for their buffet dinner). 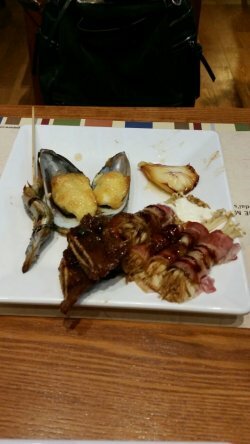 Love their modern ambience, attentive service, and large variety of food, especially their fresh seafood, tasty Korean dishes, and delicious desserts. 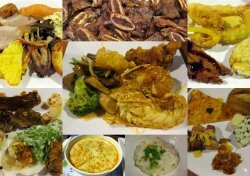 In conjunction with the launch of their theme for March 2015, 'Birthday Dishes From Around The World at Todai', they've has put together 7 dishes commonly eaten during a birthday celebration, drawing inspiration from China, Korea, Russia, Nigeria, and Ghana. 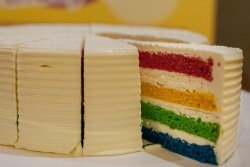 The Russian 4-Layer Birthday Cake at Todai is designed to resemble a Rainbow Cake, with the 4 distinct layers coloured a pretty red, green, yellow, and blue. Not too traditional in presentation, as the classic Russian 4-Layer Birthday Cake isn't so brightly coloured. 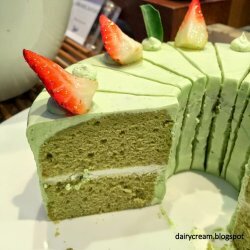 But the cake is light, moist, and fluffy in texture, with a slightly sweet, vanilla flavour. The cream is rather thick, but it's still pretty good as a dessert! The Chinese Shoutao / Shou Tao at Todai have that sweet, smooth lotus seed paste within the soft, pliable Longevity Peach Steamed Bun. While they've coloured it to a bright pink hue, the shape of the bun itself only loosely resembles a peach, looking more like a pyramid shape, and could do with a little more moulding. A decent attempt, neither terrible nor outstanding. The Nigerian Jollof Rice / Benachin at Todai has that classic deep orange colour, and the long grain rice has soaked up the tomato sauce base well, so each mouthful is a sweet, tangy taste of tomatoes. Almost like a cross between tomato rice, biryani, and paella! Texture of the rice is borders al-dente firm and soft, but at least the grains separate easily. The addition of okra / lady's fingers is an unconventional touch that differs this version from the traditional version. The Korean Japchae / Stir Fried Sweet Potato Glass Noodles at Todai is among the best dishes available here. A combination of complimenting textures, the slippery, long noodles, silky mushrooms, crunchy cabbage and carrots, seasoning of fragrant soy sauce, garlic, shredded egg, sugar, and sesame seeds. So good I kept going back for more! The Ghanaian Oto at Todai differs the greatest from its traditional, classic version. The chefs here have replaced the mashed yam / taro with mashed potatoes instead. 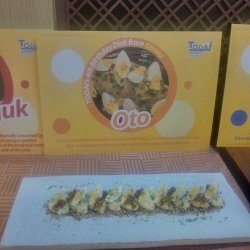 Also, as traditional Ghanaian Oto has the least ingredients as compared to the other birthday dishes, it tends to lag behind in taste, so Todai has enhanced the flavour through the use of additional garnishings. While the 7 birthday dishes are largely well executed, I would have also loved to see more such birthday dishes from around the world, such as the Sudananese Karkady, the Indian Doodh Pak, the Australian Fairy Bread, the Norwegian Blotkake, the Dutch Slagroomtaart, the Brazilian Beijinho, or the Argentine Chocotorta... maybe Todai could introduce these for their 5th Anniversary! 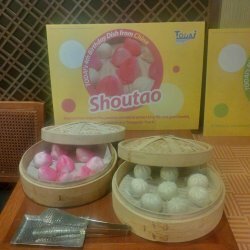 Xiu Tao (steamed buns shaped like peaches are said to attract long life and good health, hence also known as "longevity peach". Soft buns with an attractive exterior and a sweet lotus paste interior. Yi Mein (also known as "Ee Mian" is consumed on birthdays to call upon a long and prosperous life. 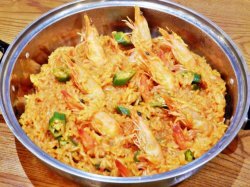 Not very distinctive in texture, this dish has a good flavor with the infusion of prawns. created in the 17th century to satisfy the Korean King's palate. 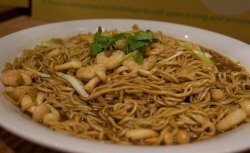 The texture and taste of this noodle dish reminds me of the Chinese glass noodles "dongfen" or "Tanghoon", except sweeter. 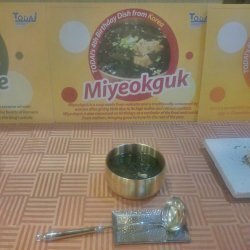 Miyeokguk is a soup made from wakame (seaweed), traditionally consumed by women after birth; also eaten on birthdays as a reminder of the food and nutrition from mothers, bringing good fortune for the rest of the years. It is a very tasty concoction. 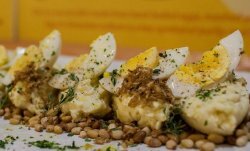 Oto is a sacred dish made from hard-boiled eggs, mashed yam and palm oil (yam is replaced by potato in this case, for a better flavor) - symbolising purity and fruitfulness. Buttery soft texture well complemented by the crunch of pine nuts. chili pepper and aromatic spices. The texture reminds one of paella while the spicy overtures is closer to bryani's, except a lot more saccharine. 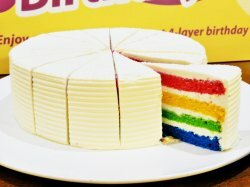 Light and sweet 4-layer birthday cake from Russia next, bearing an uncanny resemblance to rainbow cake in texture and flavor, right down the the clotted cream layered within. Lastly, the juicy and luscious Alaskan King Crab - something that everyone must eat. 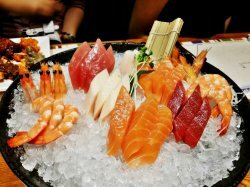 The amount of variety of food ranging from appetizer, seafood, western to desserts is alot! As usual, i always target the seafood first and i went to the seafood section. There were a plate of Oyster and all of them are so fresh and took some small slices of lemon too! 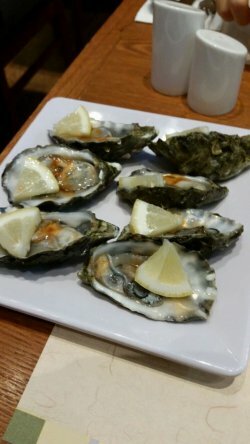 The oyster is big, juicy and tasty after eating the lemon juice onto it! It is super good and i like the Western section where they serve Thin and crispy handmade pizza. 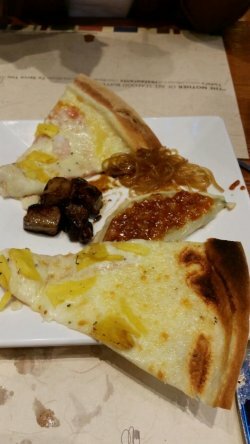 I like the fact that the pizza crust is thin and the ingredidents of the Cheese and Pineapple is generous on the Hawaiian Pizza. However i do not really like the Cheese mussel, it tasted average because its quite dry. 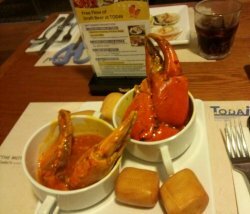 I have always wanted to try Todai as it is well known as the “Mother of all Seafoods”. 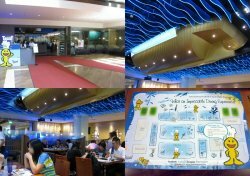 Finally has the chance to visit the restaurant as we bought a deal S$38.00nett for lunch buffet on weekdays. We made prior reservation before heading to the restaurant to avoid any disappointment. 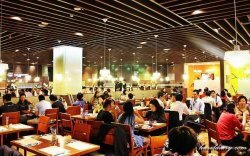 The restaurant is very spacious and huge compared to other buffet restaurants that I visited. Each section has their individual open concept kitchen where the chefs perform their tasks. All chefs are busy preparing for the foods and the display are nicely filled with beautiful decorated foods. Basically, chefs are doing their job on individual sections to ensure the turnover of foods servings. Since it is a lunch buffet, fresh oysters are not served. But snowcrabs are served for lunch though. Salmon sashimi is available as well. There is a chef at the counter slicing the sashimi live to meet the customers’ demand. I personally enjoyed the salads section.There are quite a various selections for salads and are nicely presented on the display. It is something different from the usual buffets. Different kind of dressings are mixed with the ingredients. This tempts me to try all of it. Unlike most of the restaurants, salads bar does not have choices like these. Live Italian pasta is available in request. 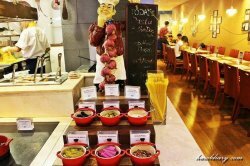 Diners can request for the available choices of pasta of the day for chef to prepare on the spot. Foods are always taste better when it is served hot. 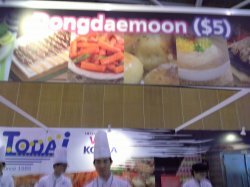 Korean section is available with some of the korean specialty foods at the section. Churrasco section has the well- grilled meats that are nicely grilled and juicy taste.Desserts section is not to miss with its variety of desserts available on the counter. Crème brulee and different flavors of mini slices of cakes are available. 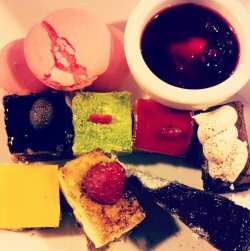 The portion of the cakes is just perfect for buffet session. This can reduce the food wastage and diners able to taste a bit of everything. The restaurant has an excellent culinary standard as the chefs delicately prepared the foods and did the art plating as well. Service staffs were prompt with their services. Plates are cleared away after I am back from my next serving. I will definitely visit to try the dinner session next round. I visited Todai restaurant 2 months ago for my dinner and was very angry with the staff that i called in to check out whether they serve chilli crabs on weekday n they said yes. But when i reached there, they told me another story saying that they only provide on weekend (i visited on Fri). Although they serve snow crab or so call King crab leg which is cold with little meat. The fish was not fresh too, I told myself that i will never visit Todai anymore. 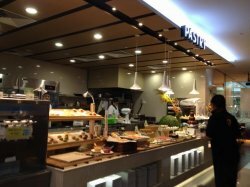 This buffet restaurant is a must have buffet if you happen to pass by this shopping mall. 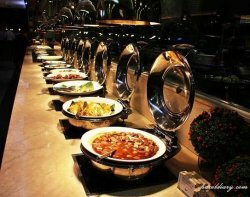 It has one of the widest buffet spread that sure will be able to impress you, which have already impressed me. The service staffs are mostly friendly and fast in clearing the tables. Restaurant dining environment is definitely nice and cosy, with very trendy designs that will never go outdated. 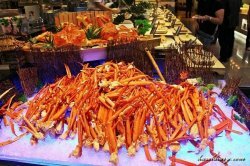 Even though my friends have all gone crazy with the unlimited snow crabs on the buffet spread, I personally prefer the abalone soup and the assorted cakes more. 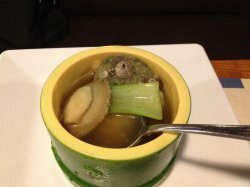 Abalone soup as you can see, is really generous as one who big piece of it can be found inside the soup. Is chewy and fresh, and the soup base is really sweet as well. As for the cakes, I very much like the butter swiss rolls and the dark chocolate mini cakes. Butter flavour is strong and the cake texture is very soft and not too sweet. Chocolate is flavourful and with the slight bitterness in it as well. Yummy! 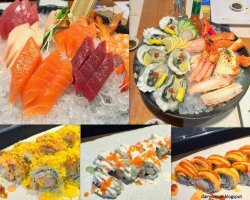 Not called the "Mother of all Seafood Buffets" for nothing - Todai is an upscale 'all you can eat' buffet concept with quality food of different cuisine and freshest quality, plus creative, fusion desserts. It also offers an ambience that is comfortable, relaxing and non-pretentious. The variety is good as well, and I like the neatness and how they categorize all different sections clearly, for instance "Seafood", "Pastries", "Italian", "Korean", "Deep Fried", "Chinese" and "Oven Baked" etc. We did not know where to start, really, as everything looked tempting. The service crew were friendly and efficient - very quick to clear unwanted plates in an unintrusive manner, and also very quick to get us things that we wanted, such as serviettes. 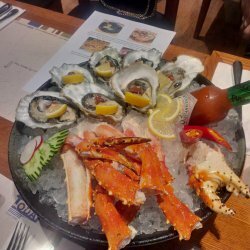 I started with very fresh and tender, slender pieces of Salmon Sashimi and Tuna Sashimi, baby squid (boiled so they were very soft), green mussels and scallops. All the shelled items were finely-textured and cooked to soft perfection with tinges of chewiness. 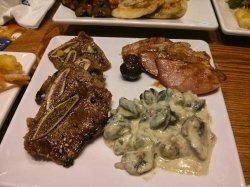 The next indulgence was Escargots - lots and lots of the chewy, "ashy" escargots cooked with mushrooms in a delicious cream sauce. In the upper photo, there are also some Shisamos (pregnant fish), grilled to perfection and filled with the bursting, sandy goodness of the roe - though Celine* commented it was somewhat cruel to eat a pregnant fish and hence she abstained from it. It made sense to me too, as tasty as it was - so I probably would not be eating this dish again. The Korean Pancake (savoury version - with flour and green beans chopped into fine dices) was rather nice - lightly flavored and easy on the tongue. As we all know, most of the international buffet provides prawns. However, Todai do not serve prawns. On the contrary, if you're crazy over crabs. You certainly should visit Todai. They serve fresh and juicy crabs. Todai has a pretty bad customer service. The staff are not knowledgeable about what the buffet serves. The worst of all was, they did not inform customers that despite making reservations they'll have to queue upon arrival. Variety of the food is not as much as those that I've gone before. Personally, I would still prefer The Line from Shangri La. It's more worth it for almost the same pricing. 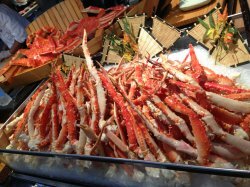 The king crab legs are piled in a stash in the centre circle of their buffet spread. Very welcoming to me. (I love seafood and especially CRABS!! )Okay, so I took one and went back to my table. They provide those crab scissors and it is available just next to the crabby station. How convenient The meat is so juicy and fresh!! sweet seafood I want to go back again for there is a variety of meats and other seafood selections too. I want to go back again for there is a variety of meats and other seafood selections too. I can’t believe I took so long to blog about Todai even though I’ve been here like four times. The first time was when the husband decided to try out his first ever eating challenge at the Todai Spicy Sushi Roll Competition. He won the challenge and received free dining vouchers. The 2nd time, we had to come back before the vouchers expired. The 3rd time? We brought the parents here to celebrate the new year because I couldn’t think of another buffet place that could satisfy their fussy taste buds. And my most recent visit? It was the parents’ request as they really enjoyed the buffet the previous time. If you ask the parents or husband to name their favourite buffet restaurant, I’m very sure they will (unanimously) say it’s Todai. And it is one of the rare occasions that I’m not quite with them. Don’t get me wrong. 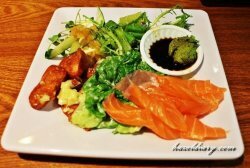 I do enjoy dining at Todai and the variety of the buffet never fails to impress me but….let’s read on to find out more. 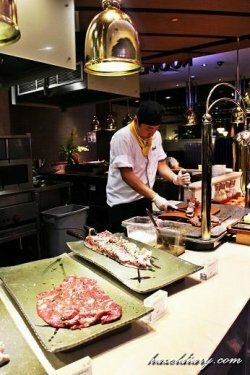 Nestled in one end of The Shoppes at Basement 2 of the Marina Bay Sands, Todai Singapore is a spacious 400-seater restaurant with a 87m long buffet line which apparently is also the longest buffet in Singapore. 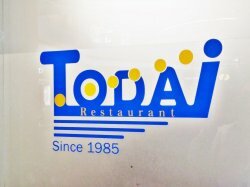 “Todai” means “Light House” in Japanese. From where we are seated in the Western Zone with a maritime/nautical theme, we can see the keel of a ship on the ceiling with blue wavy light effects to signify we are ‘under the sea’ which is cleverly designed since Todai specialises in fresh seafood. A paper place mat on the table shows you a self-explanatory map of the restaurant with the locations of the various food counters – Seafood, Sashimi, Korean, Chinese Hot Food, Western Hot Food, Oven Hot Food, Grill, Fry, Salad & Cold Appetisers, Sushi, Noodle, Churrasco, Dim Sum, Soup, Pizza, Pasta, Desserts and Beverages. I do like the structure of the buffet line as it’s grouped into different sections that requires some walking between one another. I think it’s a plus point to have a large space so you don’t have to ‘rub elbows’ with other diners. And it is a good form of exercise (for digestion) as you scan through the buffet – extremely important when you have had too much to eat! Needless to say, the seafood section is the most popular counter that most people swarm to and the good thing is, replenishing of food is very quick so the buffet line never appears to be too empty. Thumbs up. 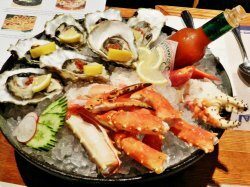 The counter boasts of an impressive bed of fresh, chilled seafood like snow crab legs, shrimps, half shell scallops, green mussels, blue mussels, clams, baby octopus and freshly shucked oysters. All beautifully presented with labels so you know what you’re taking. While the available variety and presentation are remarkable, taste wise, they are either so briny or bland that they don’t deserve a second helping. Pity. It’s my first time seeing such a huge spread of freshly pressed sushi. Most of the times, I only see one tray with a small assortment of standard nigiri so for sushi lovers, you’d have to check out the sushi section because they are quite tasty. I do like the few saucy ones. I normally skip rice in buffets but I just couldn’t resist the unique flavours and mouthwatering sights of some. Just tell the sashimi chef what you’d like and he’d slice them up for you on the spot. The cuts of the sashimi aren’t great, in fact a few pieces have chewy veins in them. Also, it is quite obvious they haven’t been thawed properly as some parts still taste icy cold so it’s definitely not of premium air-flown standard. The cold appetisers and hot food sections compensated for the mediocre seafood. 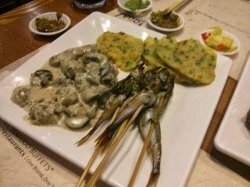 There is a great use of seafood in the various appetisers but because most of them have flavoursome dressings and seasonings, they manage to mask the lacklustre taste of the shrimps, squids and/or mussels. I enjoy the refreshing seafood salad, terrine, smoked salmon, caprese salad and assorted cold cuts. The first dish that goes the fastest is the chilli crayfish. We just happen to sit near the hot food section so we are able to land a few servings of the crayfish when the chef brought it out, fresh from the wok. The crayfish is meaty and cooked to perfection so the flesh tastes just right, neither too soft nor chewy. The sauce is exactly the same as the chilli crab sauce that we are familiar with. It has the right amount of spice in it and is not too starchy. The next must-try which I had seconds and thirds is the beef short ribs. Very well marinated and nicely grilled with a smoky flavour to it. It’s like the perfect thing to go with beer! I ordered the laksa from the noodles counter which is made to order but the seemingly diluted gravy lacks punch and is too coconut-milky for my liking. Adding extra chilli doesn’t help either. There is also abalone porridge but I don’t see where the abalone is. It is just bland, not worth any stomach space. The Chinese dishes are surprisingly above average. Some notable ones would be the Braised Sea Cucumber with Mushrooms & Broccoli, Prime Ribs, Abalone Mushrooms which are of a good restaurant standard. 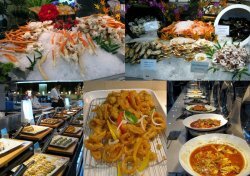 Particular for big eater and buffet lover, you should never neglect Todai located friendly at Marina Bay Sands. 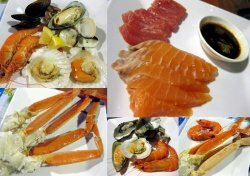 Proud of its seafood selection, it promoted healthy living and finest quality culinary. Take your time to dine here, it was a cozy place to relax. Indeed, there was much other different type of cuisines that I don’t know where to start. I took a look at this pretty prime Crab Claw, I could not resist to get it on my plate. Recently, I switched my favourite food channel to Crab, just found it very appetizing. Very juicy flesh and nice spicy gravy, it was fantastic ever. 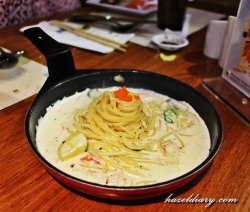 Simply take simply delicious, the food I picked so far was yummy no matter Japanese, Chinese or Western style. Even the humble fried rice and homely mixed veggies, Snow Crab was another legend with cutting scissor provided. My meal ended happily with excellent dessert, intense yet well-delicate light touch of it. Check out the latest promotion before going as it released different promotion every month. Dinner for weekdays would be $58++ for adult weekends was $68++ which refers to Friday until Sunday included public holidays. 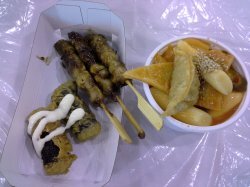 I visited Viziti Korea on 27 Oct. Todai is the invited Cuisine stall in this event. Instead of paying $30 and above for a buffet, here I could enjoy a $5 per side dish at this place. 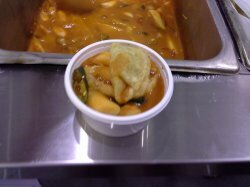 I ordered the Lian Gao, the Korean New Year Rice Cake and a piece of fried dumpling. The Lian Gao is of the right size, the soup is hot and spicy with green chilli and onion. I love the dumpling. It is crispy. I ordered the chicken stick. The chicken is juicy. I also had a spring roll. I thought it was vegetable roll but it is seaweed roll. It the seaweed has strong smell of sea. it is extra ordinary different.